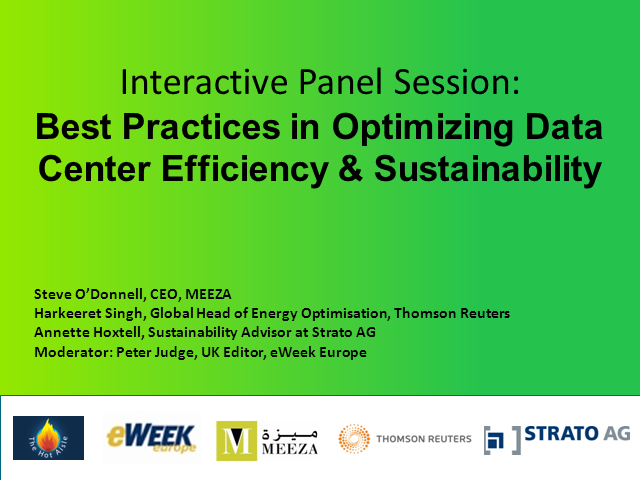 Join this expert panel session with Harkeeret Singh, Global Head of Energy Optimisation at Thomson Reuters; Annette Hoxtell, Sustainability Advisor at Strato AG and moderator Peter Judge, Editor, eWeek Europe. Please note, Steve O'Donnell, CEO, Meeza & Author of The Hot Aisle Blog was unable to join this webcast. You will have the opportunity to participate in audience votes and submit your questions to the panel during the live interactive webcast.